If you would like to Challah-it-Forward within your family and community, we'd love to help. Please fill out this form, or call 301.646.3231. Week 12: "Random Acts of Kindness"
Small hands kneading, tiny fingers rolling, whole minds concentrating, trying to tackle “the braid.” Such were the early magical moments at a recent “Challah it Forward” program at the Jewish Community Center San Francisco’s Helen Diller Preschool. It was a meaningul event, as this was the first “Challah it Forward” institutional program that had been planned after my mitzvah project began in the early Fall. After I recounted the “Challahs in the Ark” folktale to ten eager students selected from the preschool’s oldest class, Rabbi Batshir Torchio (the Senior Educator at JCCSF who had stayed up late into the night preparing many pounds of dough!) led the students through the kneading, rolling, braiding, and egg-washing. 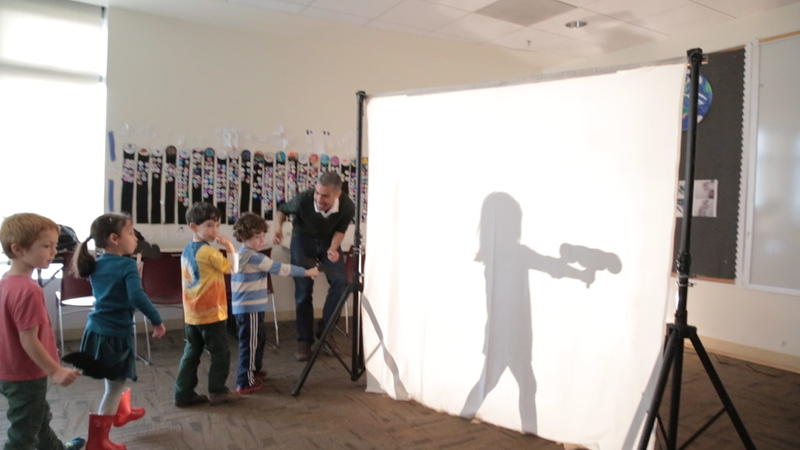 While the challah baked, I performed the shadow puppet version of the tale to 40 children, after which I facilitated a “challah hakafah” of sorts, with each student parading behind the shadow puppet screen with pre-made challah puppets. The latter magical moments occurred at the end of the morning, when a selection of the oldest children congregated to “Challah it Forward.” Where did this occur? The “Grand Lobby” of course. How did this occur? Through “Random Acts of Kindness.” The children and teachers would identify passersby, approach them and say hello, and then offer them an unsolicited, surprise loaf of Sabbath bread! The expressions of joy and utter appreciation exhibited by among others, a community librarian, two women strolling by, a grandmother and grandchild, and a mother resting on a bench, were both precious and priceless. The children were no doubt proud, as they should have been, and I was wholly inspired to continue the “Random Acts” tradition with challah, and perhaps more. Thoughts about “Random Acts of Kindness” that you’ve commited, or plan to? A pleasant week to all! Week 13: "This Land is Your Land"
Week 11: "Around the World in Four Weeks"